The City of Fredericton will be celebrating all things scientific this May in honour of the Canada Wide Science Fair (CWSF)! 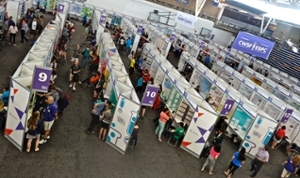 The national science fair competition is being held in New Brunswick’s capital this spring, marking the first time this event has ever been held in New Brunswick. The hosts of the CWSF are Youth Science Canada, the University of New Brunswick, and Science East. ﻿As the national championship round for the National Science Fair Program, CWSF brings together 500 finalists, between the ages of 12-17 years old, along with their parents, judges and teachers from across the country for an entire week. The finalists will compete for over $1 million in cash awards and university entrance scholarships. CWSF is expected to inject $2.5 million into the New Brunswick economy, and could become a regular event – Fredericton currently has a bid in to host CWSF every three years. Mayor Brad Woodside lauded the significance of this year’s event for Fredericton at a council-in-committee meeting earlier this week. Michelle McNeil, senior director of Conference Services at the University of New Brunswick and co-chair of CWSF 2015 thanked the mayor for his support, and is encouraging the rest of the community to follow suit. CWSF finalists will also meet with students across New Brunswick, sharing their knowledge and enthusiasm for science. David Desjardins, chief executive officer of Science East and co-chair of CWSF 2015, says that will help fuel innovation in New Brunswick’s youth. Volunteers and judges are currently being recruited. To learn more about how you can contribute to Science Week in Fredericton, email cwsf2015@unb.ca.